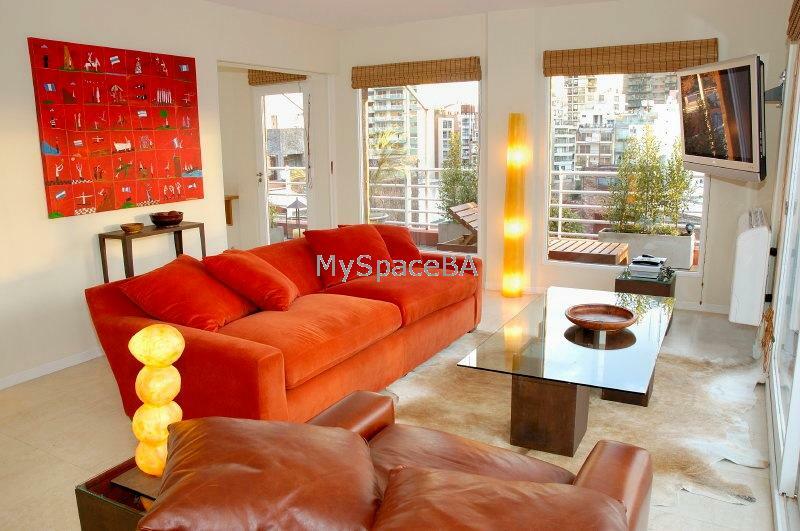 Spectacular two bedrooms apartment with lovely balcony and terrace with deck . Over 110 m2 (1200 square feet) of living space plus almost 1000 square feet of terrace space on 2 levels offering a 270-degree view of Las Canitas, the polo grounds and the city of Buenos Aires. Recently renovated, all amenities are of the highest quality, from the marble floors, granite countertops and Bosch appliances to the furniture and furnishings hand made from local leathers and fabrics, and the original paintings and art work. Step out of the front of the building and you will find a thriving collection of some of the best restaurants in the city including trendy parrillas, Italian, Japanese and Thai. Living with comfortable sofas , TV LCD with cable , fully equipped open plan kitchen . Toilete . One bathroom with shower . Both bedroom with Queen size beds . Bus routes, Parks, Restaurants, Bars, squares, Banks, Residential area, Commercial area. Hipodrome. Polo Field.